“A smile is the same in any language.” I do not know the origin of this phrase. My question to the reader is, “Do you believe it?” I did. It was a philosophy I lived. Be friendly and others will be friendly. Lately an incident occurred that has me questioning the validity of such a statement and whether one can truly believe it. Returning from my weekly Krogering trip I stopped for a red light. From the corner of my eye I caught sight of an elderly mother pushing a cumbersome grocery cart filled with laundry. It was easy to see that the buggy had a mind of its own and was bent on making the mother struggle. I have pushed a few baskets around various markets myself and am all too familiar with the difficulty involved in maneuvering some of them even in the store. I could only imagine what this bent, old woman was going through pushing the cart over cracked sidewalks, pavement and lawns. I quickly turned the corner to see if I could help. As I stopped the car the basket turned over spilling laundry and nearly bringing the lady down. I rushed to help. The look on that mother’s face when she turned to see me was a blow straight to my heart. It both staggered me and stopped me in my tracks. No one had ever looked at me in that way. Raw fear covered her face. It made me nauseous because I realized she was afraid of me! I tried smiling and telling her I wanted to help but she didn’t speak my language and I did not speak hers. My smiles and gestures were futile. Like a crazed animal she hurriedly scooped her clothes from the ground and righted the basket. In a flash she was off not looking or caring where she was going. I stood there stunned and helpless watching her. Then I realized she did not intend to stop at the intersection although the light might be against her. “Mother,” I screamed! “Come back! “Wait!” But if my words had been futile before they seemed even more so now. Aldine Mail Route is such a busy road. I held my breath and watched in horror as she pushed the buggy out into the intersection, never looking any direction but straight ahead. She was going to the Laundromat across the street. I have no doubt that God above was looking out for this lady because traffic was lighter than usual and she escaped injury. With moist eyes and a heavy heart I returned to my car. I realized that if the lady had been hit and killed it would have been as much my fault as the one who hit her. I had only wanted to help and my smile meant nothing to her. So, I wonder, is a smile really the same in every language? Or, should I have minded my own business? I understand that articles such as this demand a solution but I cannot offer one. I only know that if the opportunity presented itself again I would no doubt react in the same way. Please note that the meetings were advertised incorrectly at July 9 and July 16. The correct dates are July 7 and July 14. The HCC Board of Trustees invites North Forest Residents to learn more about the proposed Service Plan for the community and help us customize the plan for your community’s future. We will share ideas on the future of higher education and listen to ways we can better serve you. 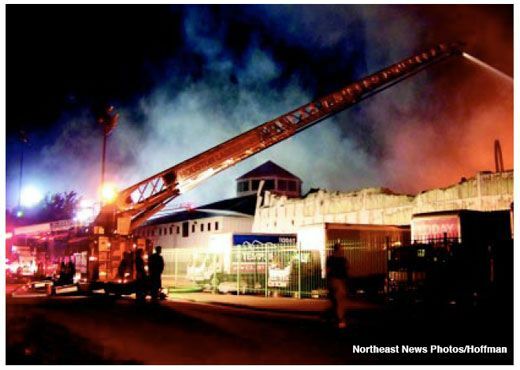 FLAMES AND SMOKE rise from Gallery Furniture’s Warehouse, to the east side of the Showroom, whose cupola can be seen in the distance. Thursday night’s fire destroyed the warehouse and the furnishings contained within, in about 2 hours. The showroom survived, with only a small amount of damage from smoke and water, due to a separation from the warehouse, and the work of the Houston fire department to contain and extinguish the blaze. NORTHEAST HOUSTON – Frightened residents of the Fairgreen neighborhood, off Lauder and JFK Blvd., attended the regular board meeting of the East Aldine District last Tuesday night, to plea for more police protection against a string of home invasions that have terrorized their neighborhood in recent weeks. Members of the group told personal stories, of a group of conmen that have systematically terrorized the neighborhood, with armed robberies and home invasions. Ironically, the complaints came after “Police Week.” a national event to honor the work of law enforcement agencies. Speaking for the East Aldine District, Executive Director David Hawes reminded the audience that the District does not have police powers, even though they pay the Sheriff’s department for special contract deputies. The only way residents can get protection is to report incidents to the Sheriff’s office, at 713-221-6000, or 9-1-1 if it is a life threatening emergency. Hawes agreed that an armed home invasion was such an emergency, and expressed concern for the residents. He indicated that the District would make certain their deputies investigated and helped with the problem. The stories covered recent break-ins, within the week, and older incidents going back a year or two, with no results or police action. They indicated the problems were getting worse. One woman told of three men with guns that broke into her house. Another told of a similar group that broke in a year ago, and stole guns that later showed up for sale in the neighborhood. Reports to the Sheriff’s office did not result in help, or arrests, they said. However, some other residents said that when they call 9-1-1 that Deputies respond quickly, usually within 2 to 3 minutes. The Fairgreen Community Association will hold its next meeting at the Lauder Road Fire Station, Tuesday, June 9th at 7 p.m. and these problems will be discussed further, they said. HOUSTON—At its monthly board meeting on May 18, North Forest ISD’s Board of Managers approved the appointment Shawn Halloran as the new athletic coordinator and head football coach for North Forest High School. Halloran is a former quarterback for the Boston College Eagles and St. Louis Cardinals. Before joining North Forest ISD, his most recent position was as an assistant coach/special teams coordinator for Yale University, where he worked to reestablish Yale’s recruiting base in Texas and helped the team to a 9-1 season in 2007 and a second place ranking in the Ivy Finale Standings. Halloran says that while recruiting in the state of Texas he has become familiar with the importance of high school athletics and a successful football program in the community. Leading and coaching a winning team is important, and Halloran says his coaching approach will also focus on discipline, pride, character, commitment and loyalty to achieve this goal. “Through the mastery of these skills, I feel each team within North Forest will be successful,” he said. NFISD Superintendent of Schools Dr. Adrain Johnson said he is certain Halloran will be an asset to both the District and the athletic program. Halloran began his coaching career as a graduate assistant at Boston College and later was an assistant coach at Worcester Polytechnic Institute. From 1993-1997 he was Georgetown University’s offensive coordinator. 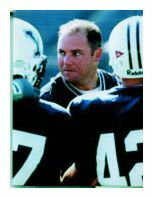 From 1997-2002 he was Yale’s special teams coordinator. There he coached Yale’s all-time leading kicker, punter and punt returner. Under his tenure, the Bulldogs won the 1999 Ivy League title. He spent the next three years as head coach at Franklin & Marshall College, where the team earned back-to-back Eastern College Athletic Conference playoff appearances, the 2004 Centennial Conference Championship and ECAC Southwest Bowl titles. Franklin & Marshall also advanced to the ECAC Southeast Bowl in 2005. In February 2006, Halloran was named offensive coordinator of the University of Pennsylvania Quakers. After one season with the Quakers, Halloran rejoined Yale as an assistant coach in May 2007. 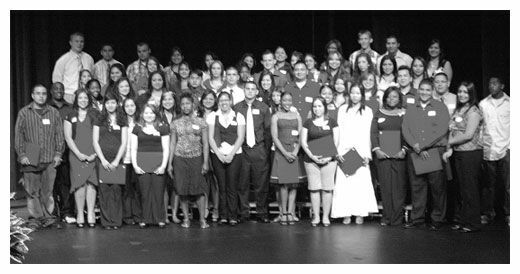 Sixty Aldine ISD seniors received Aldine Scholarship Foundation (ASF) scholarships during a reception held in their honor on Wednesday, May 20, at Lone Star College-North Harris. Had company last week, my ole country sister came to town. She stays in the deep woods of South Carolina on the Catawba River and she drips country; from the way she talks to her eating habits. We attended the Strawberry Festival in Pasadena with the real feel temperature hovering around a hundred. Tried my best to get her to ride in the helicopter but she would have nothing to do with it. Said, “I ain’t getting in no helicopter!” So me and the granddaughter got tickets and took a quick up and around the fairgrounds ride. Quickest twenty bucks I ever spent but it was worth it to see the little girl smile as we took off. This was her first time to ride in a chopper, my second and this one was jet turbine. I asked the fellow taking up tickets how much one of those helicopters cost, he quoted $1.2 million. Ole sister had her first beef brisket at the Catholic Church Bazaar Sunday. Said it was good and cleaned her plate…as usual. She was much surprised that beer was sold at the event but I told her it was to wash down the barbeque for the auction buyers. She cracks me up, at the dinner table; we have grinders for salt and pepper – remove the top, turn upside down and grind out the salt. She was sitting there twisting the dickens out of the salt and nothing would come out. She did not take the cover off and when she did, it was full of salt. Took her to our favorite Mexican restaurant and suggested she get a Summer Special. When they brought it before her, she looked at me and said, “How do I eat it.” There was fresh guacamole, a bean chalupa, a beef taco and chili con queso tostada. She managed to get through the meal and said it was very good. Lots different than the Taco Bell they have down in Columbia, SC. Quick witted she is, I made a comment about something saying, momma only raised one fool and she cut in and said, yea, he is in Texas. She worked at the bleachery for years, later going to work with Mack Trucks. She had me arm wrestle her one time and she beat my socks off. She used air tools to put the brakes on those big units and was strong from doing so. She worked on the line and said one of her girlfriends had placed a rubber snake up under a truck where she would be putting on brakes. Said that truck came down the line and she got down doing the brakes and seeing that snake, came up from there screaming and hollering. All her workers around were laughing at her hysterics. When it comes to sisters, I got the best. Harris County Precinct Two Commissioner Sylvia R. Garcia was presented with the Lifetime Achievement Award from the Hispanic Bar Association of Houston Thursday night at the group’s annual President’s Day Dinner. The award was presented by the President of the Association, Chris Garza. Garcia, a graduate of the Thurgood Marshall School of Law at Texas Southern University worked as a social worker while attending law school. 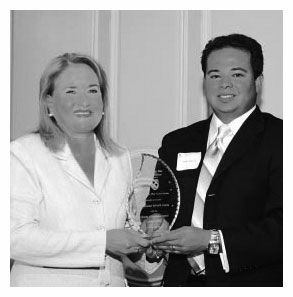 Subsequently, she worked as Chief Municipal Court Judge for the City of Houston, was elected to the position of City of Houston Controller and has served as County Commissioner since 2003. 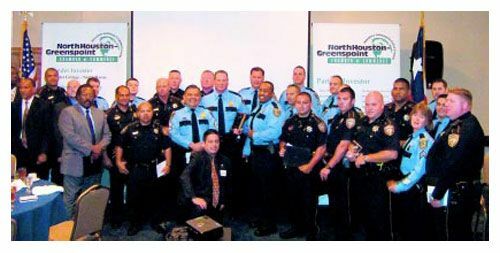 National Police Week was observed in the Northeast Houston area at a Law Enforcement Appreciation Luncheon, held by the North Houston Greenspoint Chamber of Commerce, last Thursday, May 14 at the Sheraton North Houston JFK. The awards ceremonies were conducted by Greenspoint District’s Jerry Lowry, who gave awards in various public safety categories. The room was packed with appreciative officers and the public. Lowry’s comments included his own history as a police officer. National Police Week was established by Congress in 1962, to honor officers that lost their lives in public service. Lowry noted that in the last 12 months, five officers in the area had lost their lives: HPD Gary Gryder, HPD Timothy Abernathy, DPS James Burns, DEA Thomas Byrne, and HCSO Tommy Keen. Lowry started the awards with special recognition to Katherine Cabaniss of Crime Stoppers, and Agent Ron Cutlip of the FBI. Next, he presented Officers Mike Smith and Keith Warren of the Aldine ISD Police Department with a Special Recognition Award in an investigation that led to Capital Murder charges. HPD Officers Manuel Ramirez, Rogolio Ramirez, and Michael Tewold received Distinguished Service Awards for a large drug seizure and arrests. Sheriff’s deputies of the Airline Contract Deputy unit received Distinguished Service Awards for their part in foiling an armed robbery on Airline Drive. Houston Airport Security Personnel received the Life Saving Award for saving the life of a woman with chest pain at IAH. These included James Gee, Miguel Cacho, Stephen Garcia, John Langlinais, Ron McAdams, Michael Longoria, and Jennifer Carnes. The East Aldine Pro-Active Unit received Distinguished Unit Award for their overall effectiveness in reducing crime. This included Deputies Michael Santos, Bobby Caylor, Saul Suarez, Ronathan Persaud, and Sgt. Danny Garcia. The Officer of the Year Award went to two teams instead, of the North Patrol Division, for their work on Operation Greensweep. 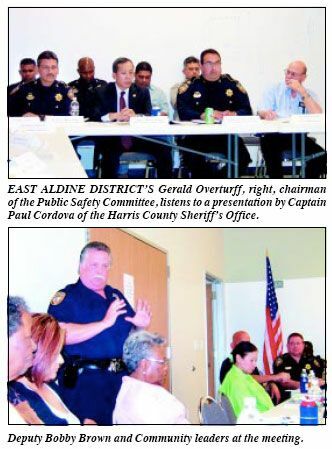 NORTHEAST– The East Aldine District sponsored an unprecedented meeting last Tuesday night, between representatives of local law enforcement agencies, and leaders of the civic clubs and associations in the District. The purpose of the meeting was a two-way conversation between the parties, to discuss law enforcement concerns of the community, and an explanation by the public safety officials and the District’s officials, about what has been accomplished and what plans are to be implemented in the future to reduce crime. The meeting was lead by the District’s officials, including Gerald Overturff, chairman of the Public Safety Committee, Clyde Bailey, EAMD chairman, and Richard Cantu, on-site Director of Services for the District. Also present were Shirley Reed of the Committee, and Marie Espinoza and Reyes Garcia from the District’s board of directors. Civic groups represented included Fairgreen, Green Forest, High Meadows North, North Houston Heights, Oakwild, Parkwood Estates, Pine Village, and Tasfield. Law Enforcement representatives came from the Harris County Sheriff’s office, the East Aldine Pro-Active unit of the HCSO, and the Aldine ISD Police Department. Also present were government officials or their representatives, including Harris County Pct. 1 and 2, State Rep. Armando Walle’s office, State Senator Mario Gallegos’ office, Congressman Gene Green’s office, and HCPH Veterinary Health office. 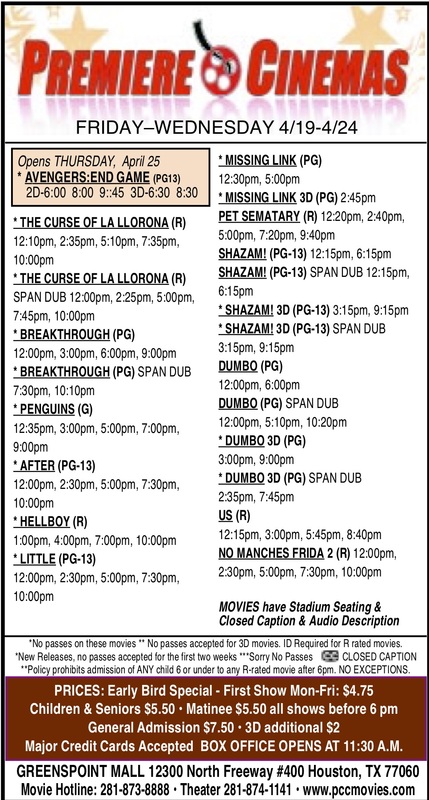 Please see print edition for more details, including specific concerns from each neighborhood.